I do live in Maine, but I also live in the middle of the state’s largest urban heat island (such as it is, in Maine.) So believe it or not, there is a brief stretch here– roughly from July 4th to Labor Day– when the weather has the potential to get uncomfortably warm. Out of those two months there are maybe eight hot nights when I lie awake in the second floor bedroom, sweltering, thinking about sleeping amidst the creepy-crawlies in the basement/dungeon. Now and then I get a fleeting urge to buy an air conditioner, but it never rises to the level of action. Temporarily changing the color of the roof, though, struck me as relatively simple. 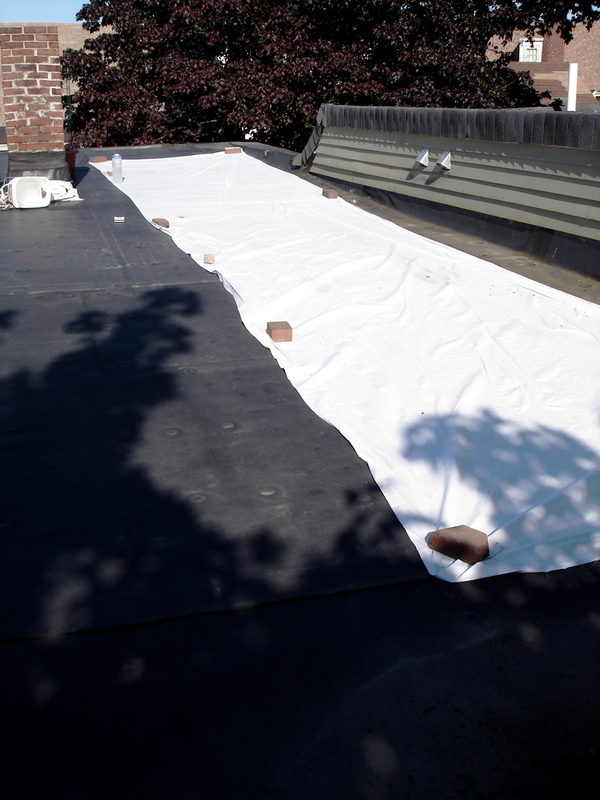 We have a flat roof with a black asphalty-rubber surface. I don’t know how much solar heat it absorbs in the winter (it’s usually covered with snow), but in the summer it gets “wicked” hot– empirically, hot enough to scorch bare feet, on a sunny hot day. I resolved to try covering the roof in some sort of white fabric. A la Christo. I went through various material options, almost settling on scrap Dacron sailcloth. But I decided to try plain old white cotton first, buying 400 sq. ft from eBay for $36. It’s cheap, and if it was a failure, at least it’s biodegradable. Plus, it can absorb a little water, which I thought would provide opportunity to try a secondary strategy of evaporative cooling (by spritzing it on extra-hot days.) It did occur to me that cotton would be susceptible to growing mold when damp, but I thought it would get enough sun between rainstorms that it would more or less get sanitized. That was before I knew it was going to rain like the bejesus all of June and into the first week of July. I carried the heap of folded fabric up on the roof the first week of June, but it started sprinkling on me, so I decided to wait till the rain stopped to unfold it. I had to wait over a month. By that time, it was getting kind of slimy. Ew. But I spread half of it out anyway, to test. Here’s how it looks: And good news: it works. When we finally got a sunny day, I took temperature measurements at the surface. The black part was 99.0F (37C). The white part was 82.6F (28C). And this, I should mention, was at 5pm, as the sun was getting pretty low– at noon, probably a bigger differential. Anyway, I’m convinced that covering the whole roof will be enough to lower my upstairs house temperature at least five degrees on the hottest of days, which is all that’s really needed. Can’t wait! This entry was posted on July 11, 2009 at 10:56 am and is filed under Summer cooling. You can follow any responses to this entry through the RSS 2.0 feed. You can leave a response, or trackback from your own site. Very cool (as it were). A temporary roof for hot weather. I like your thinking. Great thinking, but I'm pretty sure a white roof is going to be better, summer and winter.White (ok, ideally silvered) objects not only reflect away incoming radiation, they also *emit* less radiation when they're warmer than the ambient temperature. This is why thermoses are silver and radiators are black.So in the summer, when by definition there's more daytime, it has the effect of net-heat-rejection. In the winter there's more night, so white roofs achieve net-heat-retention. Pretty cool, huh?Don't think of it as white=cool and black=hot, think of it as white=less heat transfer and black=more heat transfer.PS: Also, in the winter your roof is already white, from snow!